This informative book by Author Madelon Smid provides a therapeutic approach to dealing with a variety of chronic, and oftentimes, invisible illnesses. As a person dealing with a chronic illness…Crohns Disease, Smid knows full well from first hand experience what it is like to deal with a life altering illness. 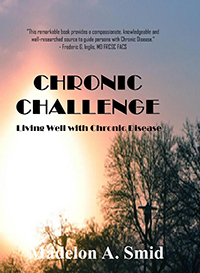 In her book, Author Madelon Smid takes the opportunity to interview a number of people both male and female that live with a chronic disease. She asks them a variety of questions to better give her reading audience the opportunity to relate to the many fears, frustrations, and emotional aspects one may experience when dealing with illnesses such as “Lupus, fibromyalgia, Crohns, MS, Chronic fatigue syndrome, SAD, and heart disease”. 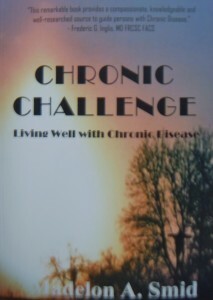 She seeks answers from both the person suffering with the illness as well as from some of their care givers. 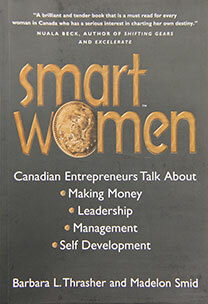 There is plenty of excellent information and suggestions given on achieving better life skills. 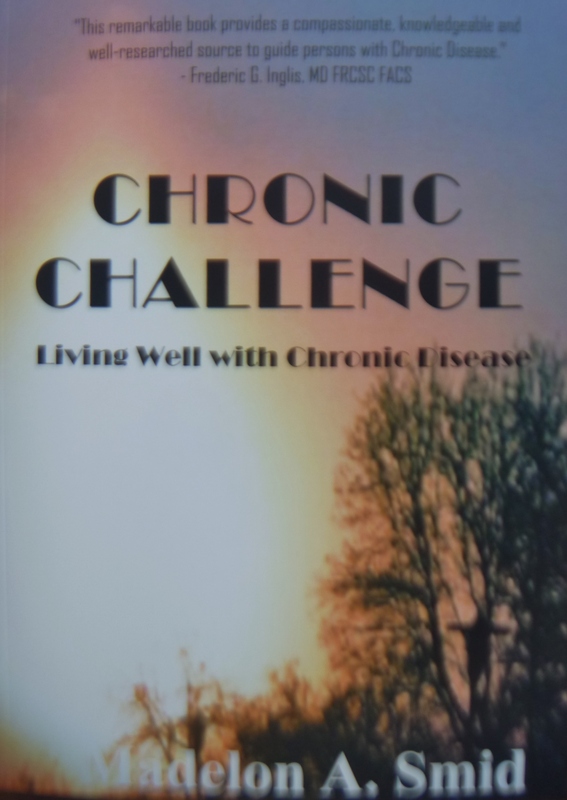 This is an effort to provide much needed guidance on developing ways to cope with chronic disease as well as the unpleasant side-effects of “disabling injuries or limitations caused by aging, strokes, or diabetes”. The common thread between these illnesses is that several of them may pose many of the same kinds of challenges. 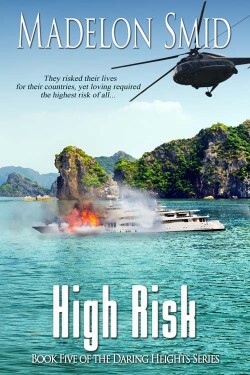 Explosions, MANPAD missiles, rock climbing, bullets flying in all directions, and old friends getting together (Te, RG, and the rest of their group along with Anton Zhang) all contribute to the intense action in this book. I will admit that preparation for the funeral for Weng, a personal guard for Anton, was most interesting. Weng was single and as a Buddhist only the younger ones in his family could mourn at the service. Want blood-pounding action and sizzling romance all wrapped up in one delicious roller coaster of a read? REACHING HIGH delivers just that. 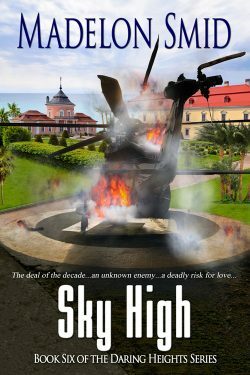 The author also gives the reader a huge dose of excellently detailed military know-how, and moves the story along with tight, crackling dialogue. 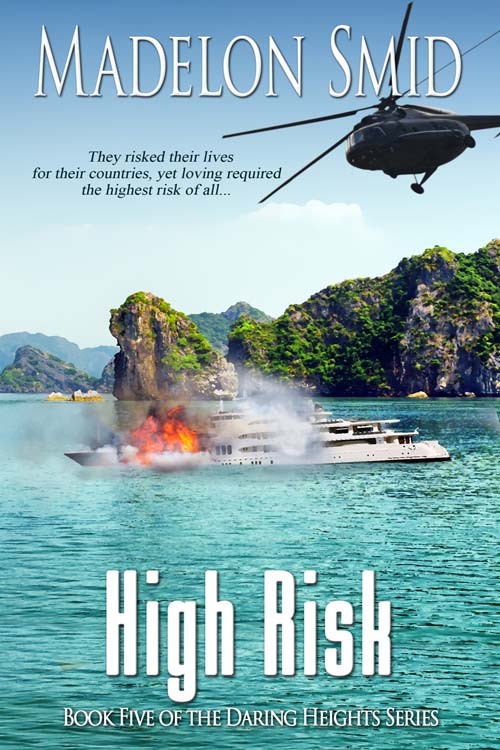 RG and Tè, the story’s protagonists are very believable and satisfyingly fallible in their struggles to balance their life-and-death occupations with the danger of their attraction for each other. The characters were well-developed and their situations were rich with emotions, leaving me rooting for them, turning pages well past my bed-time in order to see what was going to happen next. Their perilous journey to save the love they sought was tense, touching, and totally satisfying, and well worth the lost hours of sleep! 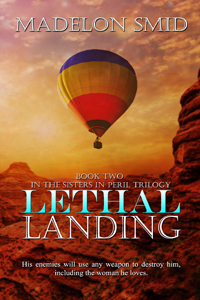 Buckle up your seat belts for this outstanding book that has a combination of suspense, mystery and a triple thriller. It is as though one is on a roller coaster ride with multiple destinations. The story revolves around RG Gribbs, First SGT USA, RET, and currently the boss of Safeguard Company Inc. During his active duty service he was a Delta Force Operator so knowing that one item, the reader knows that this man is able to kick a** and take names. Tè Zhang, a female op is working for his company now. The main antagonist Wang has a past history involving Te that goes back years. Both China and the US governments are searching for him at the present time. Anton, Te’s brother also has a most interesting role in this novel. It is indeed a whirl wind of activity in which the main characters are like globe trotters. Toss in some steamy romps in the bed to break up the extreme tension in the action, and the reader is set to keep on turning the pages. Some things that I really liked about this book are the strong female characters with the leading roles. In addition, the author has nailed the PTSD portion of this book and also has an incredible knowledge of human nature. She gets into the ‘nitty gritty’ of the characters which enables the reader to understand their motives better. One example of this would be with Wang and realizing how his fiscal collapse would cause him to lose face. I almost forgot to mention the fact that RG’s company funds PTSD victims and recently started assisting the families of the victims. All in all, an incredible read for me and most highly recommended. 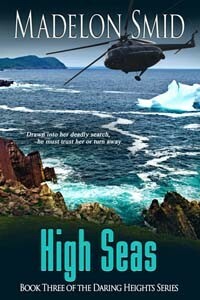 “This story[High Seas]evolves quickly into an adrenaline rush. A couple of reasons that I found this book to be a fascinating read are: (1) the author has a firm grasp on human nature and the expectations and disappointments that go along with life and (2) the descriptions throughout the book are laced with both metaphors and similes which greatly enhance the story. One example that comes to mind is: ‘His heart thumped like a Comanche drum calling for war’. 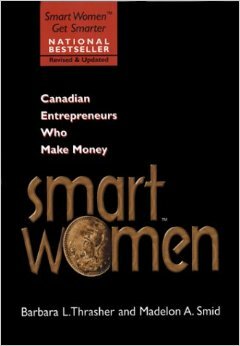 All in all, an excellent read for me. Full of action, adventure and human nature. I must admit that if I were younger and my knees were better, I would definitely try a little kayaking! And, I love the ending, as well. Most highly recommended. Off Grid..and Loving it! 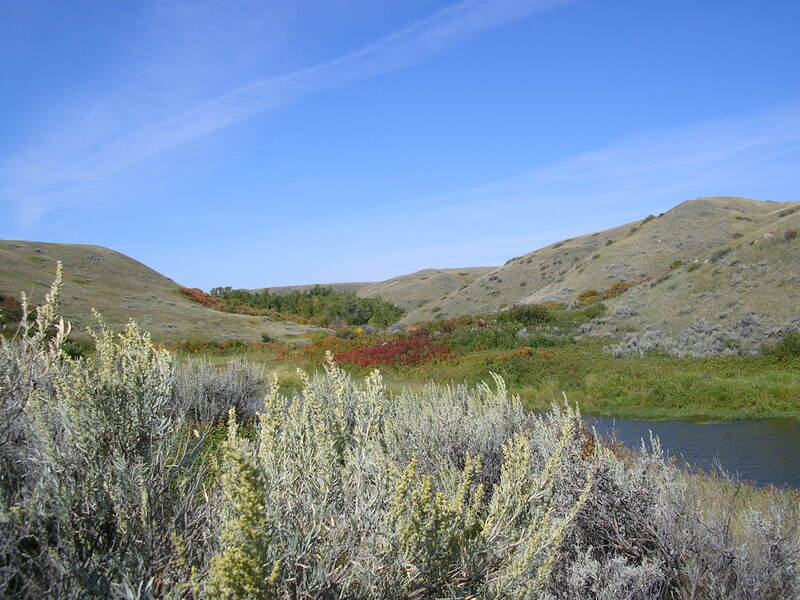 TOP 500 REVIEWER 5.0 out of 5 starsA great summer escape! “High Ground has rich descriptions throughout, characters are well developed and the story is full of action and adventure. I was pleasantly surprised to learn that one of the main characters, Cat Duplessis, is a veteran of Afghanistan and an ex-Marine. Personally, I don’t think there is any such thing as an ex-Marine! After her discharge, she gained employment working as a female security officer. That kick a.. training and strategic knowledge makes her an ideal hire for the new job. Her new gig involves protecting Joshua Chandler, the spy master! Someone (or several people) are out to get Josh in a most deadly manner. The FBI, the CIA and Homeland Security come into play in this one, as well. Josh is so well known in the cyber world that he has to testify on the Hill and be a key witness at a trial. His foundation work also puts him in the public’s eye which creates another opportunity for mayhem. So, Cat is faced with a 24 – 7 protection for this man she met a few years ago. Chemistry is conflicted between them from that first meeting. As time goes on, however, things really heat up! The ‘hunger for victory’ that is inherent in both of their souls drive them higher than they ever thought possible. “5 out of 5 Stars – A riveting read so well written with detail, it’s hard to believe it’s fiction! 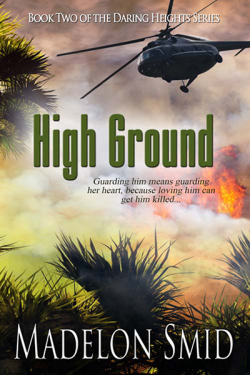 High Ground is a riveting story about government agencies, with a plot so twisting it’s impossible to see what’s coming next and so compelling that it’s near impossible to put down. 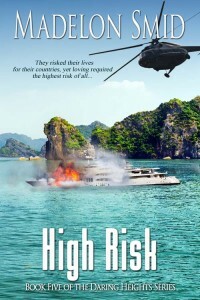 Not only did I get my fill of an action novel (and a top notch thriller at that) but the main characters become intensely and emotionally intertwined in an arousing fireball that in itself is steamy enough to grab any romance reader’s interest. With a captivating mix of romance, thriller, and action, High Ground was a great introduction for me to this author’s writing and I’m pleased to see she has more novels available. 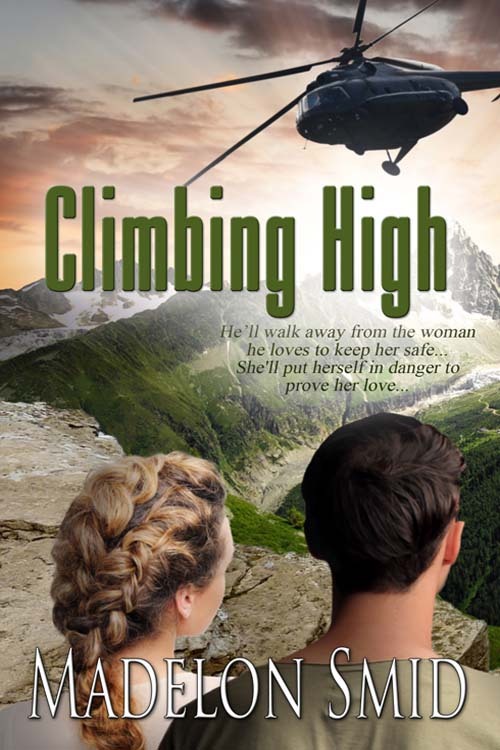 A detailed contemporary military thriller, complete with a hot and lusty romance, this story has something for everyone and I highly recommend this book to lovers of all genres. 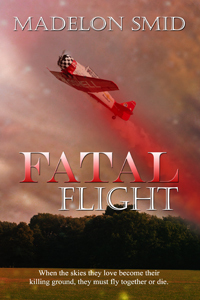 Great escapist reading!” Dianne Greenlay, Author of the Award-winning Quintspinner Series. “Madelon Smid has a knack for writing strong mentally, emotionally involved characters like Cat and Josh, that keep you wanting to find out more and more. 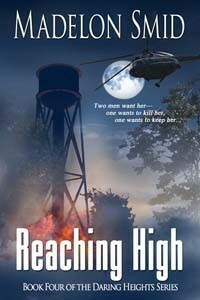 High Ground is definitely on the top of my recommendation list.” ~ Tekeyla Friday, author of Bothers: Powers of the Archangel Michael. “High Ground by Madelon Smid is a romp of intrigue, danger, and sexual tension. Smid’s writing is concise and conversational with many interesting and original metaphors. When the female protagonist isn’t thwarting murder attempts on her male counterpart’s life, she and he are fighting a losing battle over their lusty attraction to one another. My preference would be for a more subtle, gradual build to one final climax (so to speak) of their love, but every reader will respond differently. Conflicting emotions of self-doubt and soul-searching lead to misunderstandings and the sacrifices made by each to protect the other. Tidbits of interesting detail regarding food, computer jargon, medicine, guns and ammunition, Shakespearean quotations, etc. are sprinkled throughout. I did find all the initial abbreviations a bit distracting, having to sift through NSA, NDD, FBI, CIA, SUV, P.A., D.C., GPS, USB, ID, and a character named RG.